Who was Dr. Fritz Kraemer? Dr. Fritz G. A. Kraemer was the most influential German in the Pentagon from 1952 to 1978. Geostrategic Advisor to the U.S. Army Chief of Staff in the U.S. Department of Defense. The true "Dr. Strangelove" – uniquewith monocle and walking stick, a last Prussian at the Potomac River in Washington DC. A German emigrant to the U.S., born in Essen in 1908, with Christian denomination but Jewish roots. Kraemer, an intellectual with two PhD's, scraped a living as farm worker for five years. In 1944 he was conscripted and thus became a U.S. citizen. 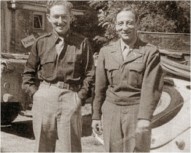 Dr. Fritz Kraemer with his protégé Henry Kissinger as soldiers of the 84th U.S. Infantry Division in Germany, 1945, fighting for the liberation of their former Vaterland. Kraemer discovered and mentored two U.S. Secretaries of State: Henry Kissinger and Alexander Haig. In 1944, he met the 19-year-old soldier Henry Kissinger who had also emigrated from Germany. He formed – as "Kissinger's Kissinger" - his thinking and worldview and fought with him in the 84th U.S. Infantry Division for the liberation of Europe. Kissinger himself writes about it in the new book "True Keeper of the Holy Flame" by Hubertus Hoffmann. Kraemer placed young Lieutenant Colonel Alexander Haig with newly appointed National Security Advisor Henry Kissinger in the White House. The later U.S. Secretary of State describes how this was possible in his contribution to the book. Fritz Kraemer saw himself as a missionary of freedom and a mentor for unknown young talents who should take over responsibility for their country as a new elite. He was co-founder of the American school of thought "Peace through Strength" ("No provocative weakness, please!" became an often cited dictum) to improve the world and promote the consideration of human psychology in international relations – with 'inner musicality' for a foreign policy with a soul. A critic of moral relativism and of a fearful and weak bourgeoisie, who according to him do not understand the threat through totalitarian radicals and most times shy away from it. As a young boy Kraemer experienced the German Empire, as student the Weimar Republic and the rise of Adolf Hitler. From 1944 he fought for the liberation of his homeland from totalitarianism with the United States Army. In the Pentagon he became the grey eminence during the Cold War, an authority on Germany and an educator of high-ranking officers and politicians. He always remained a true Prussian inside his heart and stood by his strong principals of a freedom fighter. He passed away in 2003 and was buried with full military honors at the Arlington National Cemetery. The eulogy was delivered by his former pupil Henry Kissinger, with whom he had not spoken since the mid 1970's. Hubertus Hoffmann, in his new book, explains for the first time why Kraemer and Kissinger split. His master pupil and former U.S. Secretary of State Henry Kissinger: "Fritz Kraemer was the greatest single influence of my formative years. An extraordinary man who will be part of my life as long as I draw breath. " His protégé, former U.S. Secretary of State Alexander Haig: "For me, Dr. Kraemer's lifetime of service confirms the importance of the Nation's elites in pursuing and advancing the value of a free society. I can think of no individual whose patient tutelage made a more meaningful contribution to the shaping of my own worldview." U.S. President Richard Nixon whom he briefed with Kissinger in the Oval Office on October 24, 1972 praises: "I like him and read his stuff – I appreciate to have an intelligent appraisal by someone who really understands great forces at work in the world. It's been very helpful." The futurologist Herman Kahn of the Hudson Institute writes: "If there is anyone who has stood for the good and the true, it is Fritz Kraemer. He knows what he stands for and says what he stands for." Henning-Hubertus Baron von Steuben puts Fritz Kraemer alongside one of his ancestors Friedrich Wilhelm von Steuben, the first Inspector General of the U.S. Army under George Washington: "Steuben and Kraemer have, at the intervals of two centuries, put their mark on the United States Army as officers through their deeply rooted Prussian values such as integrity, honour, discipline and duty for their homeland and coined the United States Army with their spirit." We need a responsible elite in our democracies. They must assume key functions in our society. It is not about privilege or wealth, but about special responsibility. We should seek out men and women of excellence, support them permanently as mentors, instruct and encourage them. Too few personalities dedicate themselves to this task. They rather rally celebrities than care for unknown young talents. We are too often prone to mediocrity in our egalitarian democracies, because hardly anyone loves the one who supersedes others. There is a danger that our foreign and security policy will become mediocre and dull. Thus, we must constantly enrich our politics with fresh talents with good ideas and ideals. Many politicians 'start as a grape and end as a raisin'. During their long careers they have left part of their soul on every rung of the ladder of success, compromising and sailing with the wind. Great tasks await us in this world, but small interests govern. We must actively change reality and the world for the better instead of passively adapting to a bad reality. Our bourgeois society is idle and coward at heart. It does not recognize the threat posed by the few determined radicals, or only when it is too late. The youth should not get lost in materialism but stay true to themselves. A fulfilled life requires idealism, not materialism. We need true individualism, striving against the stream, courage and self-discipline. Be a person in your own right and do not mindlessly follow the masses as an opportunist. Develop into a person with good character, iron will, courage and much energy. Think about everything over and over again. Become an independent, strong personality like a tower of strength. Do not only work for your career, but for a good cause. Stand up for your convictions. Speak what you think and feel. Believe in absolute values and a Holy Flame. Follow a code of honour. Say what you think and not what is expected of you. Be a little adventurous and courageous. Always think about the souls of other people and be friendly. Change the reality instead of passively adapting to it. Fight for the good and against the harassment of human dignity and liberty. Take over responsibilities and do not ask what you get back from it. Now a new book has been published about him. Former U.S. Secretaries of State Henry Kissinger and Alexander Haig, who both were discovered and supported by Fritz Kraemer, former U.S. Secretary of Defense Donald Rumsfeld, former U.S. Ambassadors Edward L. Rowny and Vernon A. Walters, German politician Friedrich Merz, NATO-General ret. Klaus Naumann, Henning-Hubertus Baron von Steuben and Hubertus Hoffmann tell his story on 384 pages in "True Keeper of the Holy Flame. The Legacy of Pentagon Strategist and Mentor Dr Fritz Kraemer". Pulitzer Prize Winner Norman Mailer praises: "A fantastic book. Hubertus Hoffmann knows how to describe the genius of a man, who has influenced the thinking and planning of the Pentagon for several decades, probably more than anyone before him." The former Chief of Staff of the German Bundeswehr and highest-ranking NATO General Klaus Naumann observes: " Fritz Kraemer is more up-to-date than ever. This book is a monument for a man for whom values – a moral ethical system of coordinates and convictions – comprised the hallmark of his life, values that Fritz Kraemer would not surrender under any circumstances. People of this caliber are the exception in all ages, but today among our superficial, value-free, "me" generation they ought to be a protected species. I think it is high time to remember Fritz Kraemer and to take this book to heart." The book, published by the Inspiration Un Limited publishing house in London and Berlin, includes many large pictures and illustrations. More information at www.worldsecuritynetwork.com/fritzkraemer and on Facebook under Fritz Kraemer Pentagon Strategist Mentor Missionary. India's farmer suicide epidemic could be stopped! WHY DOES THE US BLOCK HARMEL II IN NATO?